Two adventures, two days, for two people. We are happy to team up with International Mountain Climbing School (IMCS) of North Conway to introduce an exciting late-season special. We’re offering two full days of adventuring fun for you and your buddy or significant other. On the first day hike or scramble with a Redline Guiding guide and explore some of our White Mountains awesomeness by way of select hiking trails. On day two, test your mettle and rock climb (or learn to) with the experts at IMCS. Or flip it around if you want. It’s okay with us. Total cost, excluding gear, gratuities, lodging, meals, and travel expenses, is ONLY $499. This adds up to a pretty significant savings and one heck of a fun way to finish off the month of October. No trick, all treat. 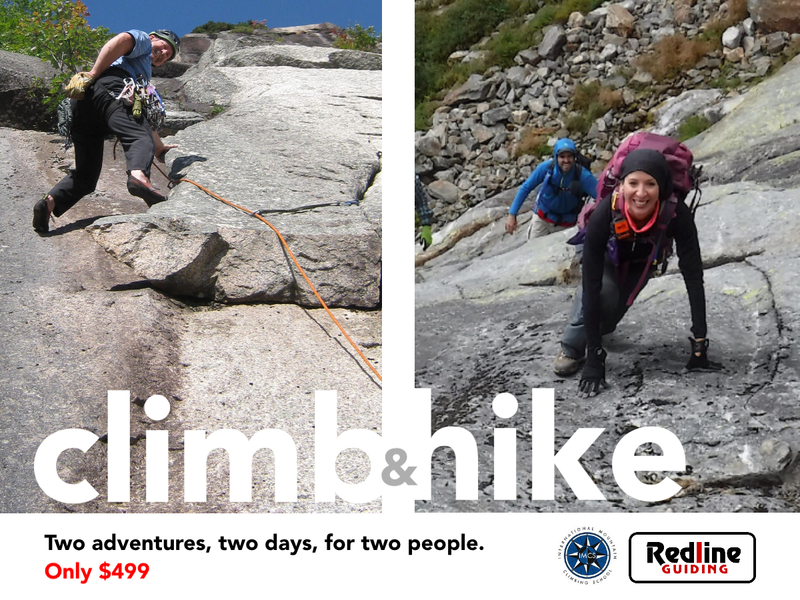 Grab someone and pick two days between Tuesday Oct 24th and Tuesday October 31st to hike and climb. No, they don’t have to be consecutive, but it might make more sense if they are. Use our Booking form (choose “Unlisted Activity“) and refer to this “Two for Two” special where it asks. Both companies will respond shortly. Redline Guiding will ask for a 50% deposit. There are many choices in the Mt Washington Valley. This time, try one of our two lodging partners, the Schoolhouse Motel or the Eagle Mountain House. Mention this promotion to get a discount. Show up dressed *appropriately for your adventure and our mountain weather. Questions? Ask us! The 50% balance will be due and payable to IMCS at the start of your day with them. * Both IMCS and Redline Guiding can help you with your specific gear needs during your time with us. Both companies have rental gear available. Please note, however, the gear questions on the booking form are for Redline Guiding and pertain to their hiking gear requirements, Ready Packs, etc. IMCS will be in touch independently to discuss their climbing gear like helmets, harnesses, and rock climbing shoes.